Reading books like this make me feel like I’m an expert. Of course, it’s author Tom Acitelli who’s the expert on the history of America’s craft beer revolution, not me. But he tells the story with such clarity and detail in this incredibly researched book that any reader will feel like an expert on the America’s craft beer revolution after reading his new book, The Audacity of Hops. Acitelli pulls off this audacious plan to include so many different actors and stories of craft beer’s origins and weave them into a engaging and sweeping narrative using a concise, yet conversational tone providing just enough detail to keep everything connected together. This book could have easily degenerated into a tedious, linear “checklist” of people and events, collapsing under the shear weight of Acitelli’s research. Instead, Acitelli integrates numerous short, bite-sized chapters into a mosaic from which the story of craft beer emerges, a story where just a couple breweries in the 70’s and a few scattered homebrew clubs to somehow coalesced into the 10 billion dollar industry craft beer is today. Of the many insights I gained from this book, four really stand out. I’ve always been struck by how chummy “competitive” craft breweries always are. Arguably, that was integrated into the industry’s DNA from the beginning since the late 70’s, an example being Anchor’s Fritz Maytag letting New Albion’s Jack McAuliffe drive his pick-up from Sonoma County to Anchor’s Brewery to fill it up with as much malt as he could load in the flatbed. There was no other way McAuliffe could obtain malt in the low quantities his small brewery could afford, and without Maytag’s assistance, New Albion would have ceased operations much sooner than it did. From almost the very beginning, new breweries used the trick of short circuiting the need for enormous capital investments to build a brewery by finding breweries to make their beer under contract. Plenty of breweries with excess capacity were only happy to oblige back in the 80’s, as they do today. Fritz Maytag’s main beer was a Steam, Jack McAuliffe’s New Albion Brewery made Stouts, Porters and Pale Ales, Sierra Nevada’s Ken Grossman claim to fame was a Pale Ale (albeit a hoppy one), Jim Koch’s Boston Beer brewed a Lager, New Belgium and Pete Slosberg’s made their names with Amber Ales. The IPA really doesn’t arrive on the scene in a big way until the last decade. It’s an open question whether we’re entering a craft brewing bubble with all the new breweries being founded and increasing capacity of existing breweries. Most of these recent new breweries are in the classical tradition of home brewers turned businessmen, turning their passion for brewing into their livelihoods. Whatever happens, it will certainly have a different character than the bubble in the late 90’s where a lot of outside investors looking to get rich quickly with public offerings got burned, a product of those go-go times. 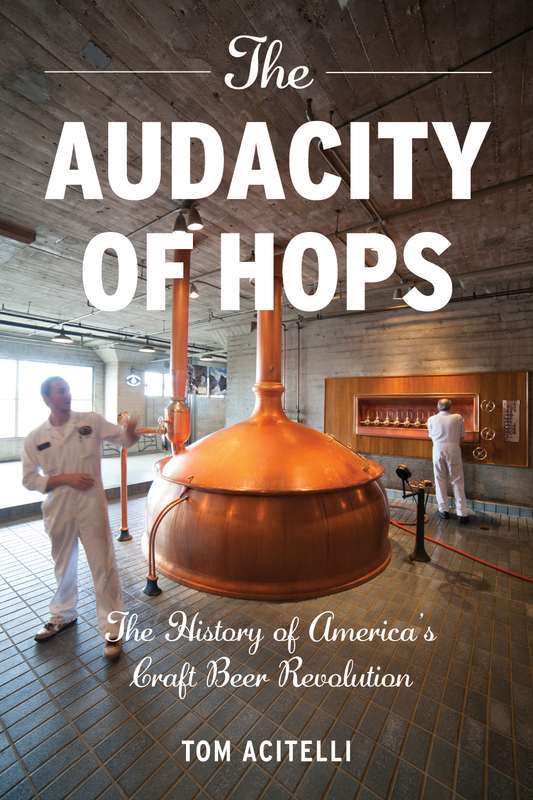 Interestingly enough, I started reading “The Audacity of Hops” a few days after finishing “Bitter Brew”, William Knoedelseder’s excellent book about the rise and fall of Anhueser-Busch. From afar, Anhueser-Busch looked like a mighty fortress. But within, this company run as a virtual Busch-family monarchy struggled mightily since the 70’s due to unchecked power and privilege of wealthy Busch family members who became increasingly out of touch and unfit to run the company. Bitter Brew was a fascinating contrast to the story of people like Fritz Maytag and Ken Grossman who built up their empires from virtually nothing through shear hard work and innovation. Next Next post: Rambles: August Brings New Beers, A New Book, and Spread!